The letter was sent to Sen. Ron Johnson, chairman of the Senate Committee on Homeland Security and Rep. Jason Chaffetz, the chairman of the House Committee on Oversight and Government Reform, as well as ranking members of those committees. Rep. Devin Nunes, the chairman of the House Permanent Select Committee on Intelligence, Rep. Robert Goodlatte, the chairman of the House Judiciary Committee and Sen. Charles Grassley, the chair of the Senate Judiciary Committee, also were sent this letter. That’s admitting that the major insurance companies will pull out of the individual markets if they aren’t granted major premium increases each year! It’s worth noting that Sen. Rubio forced this by getting a bill passed that ended insurance company bailouts. Think about that. President Obama knew that his signature achievement would bankrupt insurance companies if it didn’t have a bailout provision in it. Compare that with Minnesota prior to Obamacare/MNsure. Minnesota virtually eliminated the uninsured by establishing a high-risk pool in 1976. Thanks to that system, Minnesota’s uninsured rate was a paltry 7.2% in 2007. Last week, I wrote this post, noting that the national uninsured rate was 15.5%. Minnesotans, the last time we had a DFL governor and DFL majorities in the House and Senate, we got a Senate Office Building for fat-cat politicians and skyrocketing health insurance premiums. Exploding health insurance premiums and a $90,000,000 building for fat-cat politicians isn’t taking us in the right direction. I’m betting people think that that’s taking Minnesota in the wrong direction. Finally, Gov. Dayton, if things aren’t that bad, why are you, Rep. Thissen and Commissioner Rothman calling this a crisis? Republicans should willingly accept the fight that the Democrats have picked on defense spending. Democrats just picked the fight by filibustering the bill that would fund the military, including funding overseas operations against ISIS. If Democrats are willing to shut down the government over fulfilling the Democrats’ special interest allies’ wish list, Republicans should highlight that. If Democrats want to commit political suicide, then it’s Republicans’ responsibility to make them pay for that stupidity. It’s time for Democrats to put on their big boy britches and negotiate in good faith. If they won’t fund the military unless they get everything they want for their special interest allies, then they aren’t fit to chair the Senate’s committees. Period. They aren’t fit for those responsibilities because they’re too beholden to the special interests to do what’s right for America. The federal government’s chief responsibility is to keep Americans safe and provide the resources our military needs to do its job, and it’s a shame Senate Democrats are refusing to do either by blocking this bill for the third time this year. In addition to funding our military, this bill would also have made it crystal clear to the administration that dangerous terrorists must remain at the detention facility in Guantanamo Bay. In these last four months of President Obama’s term, we need to do everything possible to stop him from releasing dangerous terrorists to other countries, or bringing them into the U.S. This includes keeping the 18 “forever prisoners“, which an independent board has deemed too dangerous to ever release, right where they are. This is a fight that Republicans should fight with Democrats. Let the people see that Democrats aren’t ready to chair the important committees that fund this nation’s national security operations. Let the people see that Democrats consistently put a higher priority on political gamesmanship than they put on doing what’s right for our troops. This article isn’t good news for Chuck Schumer. Sen. Schumer wants to be the Senate Majority Leader in January. At this point, that’s looking like an uphill fight. The worse news is that it’s looking like the Democrats’ fight is getting more uphill by the week. This is now a safe Republican seat. That poll takes this seat off the list of seats that the Democrats might potentially pick up. 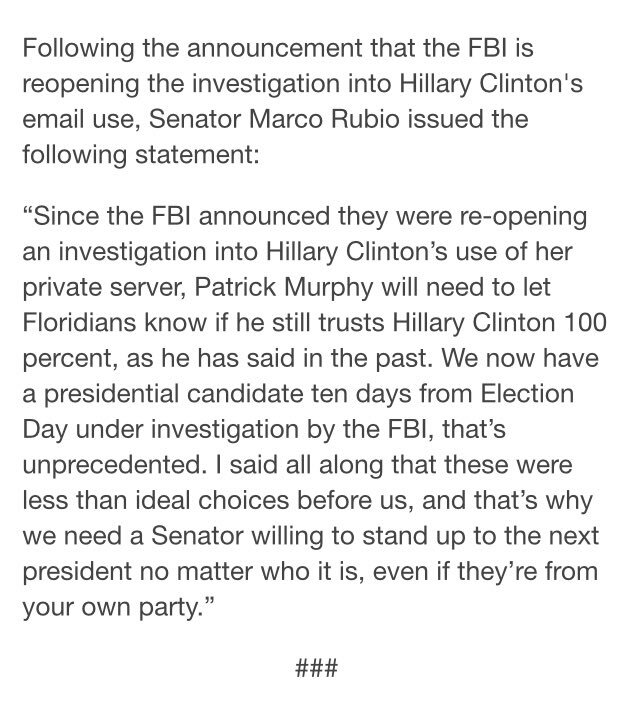 That’s quite a difference from when Sen. Rubio initially announced that he’d seek re-election. At the time, the Cook Political Report said “Republican U.S. Sen. Marco Rubio has reversed his decision to retire from the Senate at the end of this Congress and will run for a second term. In doing so, he has breathed new life into the GOP’s chances of holding the seat, but that doesn’t mean that he has become anything more than the very slightest of favorites in November. The race will remain in the Toss Up column.” It will be interesting to see how Cook explains what tipped that race that quickly. Remember that this poll happened before the terrorist attack in Nice, France. If I were a betting man, I’d bet the proverbial ranch that Rubio will have opened up a bigger lead next month, especially if the tempo of ISIS-inspired terrorist attacks keeps increasing. Quinnipiac’s Swing State Poll isn’t good news for Ohio Democrats, either. Their poll says “Sen. Rob Portman [leads]former Gov. Ted Strickland 47–40%.” A couple months back, Portman trailed by 9 points. The next Quinnipiac Swing State Poll had them tied. Now, Portman has opened an outside-the-margin-of-error lead over Gov. Strickland. Clearly, it’s trending in Sen. Portman’s direction. What’s interesting about this is the fact that Gov. Strickland has higher name recognition than Sen. Portman. The man-woman matchup in the Pennsylvania Senate race produces only a small gender gap. Men back Toomey 53%-35%, while women are divided with 45 percent for Toomey and 42 percent for McGinty. In the pure horse race poll, “Sen. Pat Toomey over Democrat Katie McGinty 49%-39%.” It’s probably too early to say this race is over but it isn’t too early to say that Sen. Toomey is in a solid position to win re-election. While the presidential matchup in Pennsylvania and the U.S. Senate race both feature a Democratic woman running against a Republican man, Sen. Pat Toomey has the advantage of incumbency. He leads 56 – 35 percent among men, while women are divided with 44 percent for Katie McGinty and 42 percent for Toomey. If Republicans hold those 3 seats, they’ll hold their majority in the Senate. I expect them to hold Wisconsin, too, where Ron Johnson will benefit from the fact that he’s running 5+ points ahead of Trump in Wisconsin. Something noteworthy is happening, too. Each of these candidates are running well ahead of Mr. Trump. While it’s still early, this suggests that voters are differentiating between Mr. Trump and mainstream Republicans. If that’s what’s happening, then that’s good news for those who’ve been worried about a major GOP thumping this upcoming November. With Rubio now officially running for re-election, coupled with this news, the NRSC just got a major morale boost. 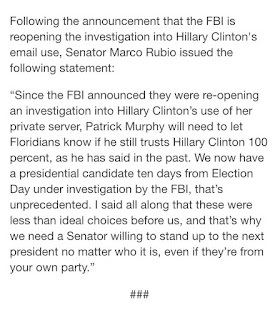 If I were a betting man, and I am from time to time, I’d bet that Sen. Rubio will run for re-election. 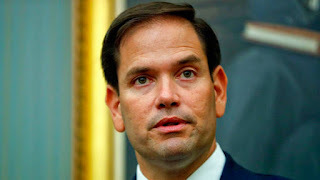 According to the article, “Politico reported Wednesday that López-Cantera had urged Rubio to jump in the race, saying he would back out if the senator ran for reelection.” I can’t see Sen. Rubio saying no at this point, especially considering the fact that his friend has a) urged him to run and b) promised to drop out if Sen. Rubio runs for re-election. After the Orlando bombing, and considering the fact that Sen. Rubio would have a prominent role in crafting policies to prevent terrorist attacks, it’s difficult picturing Sen. Rubio declining this option. Further, this is pretty much proof that Sen. Rubio isn’t on Trump’s short list of VP candidates. Either that or Sen. Rubio doesn’t want to be on Mr. Trump’s short list. 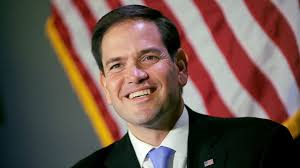 Either way, if Sen. Rubio runs for re-election, that eliminates the possibility of the Democrats flipping that seat. It doesn’t hurt the Democrats’ chances of picking up Florida’s senate seat. It eliminates that possibility.